Perfect for the everyday operations of any restaurant, this mid-sized bus box is an effective and efficient way to transport goods from the table back to the kitchen. This versatile black bus tub measures 20" x 15" x 7" and boasts durable plastic construction built to carry even the heaviest of dinnerware. This is actually very light compared to the some of the ones I used before. The material is heavy duty and restaurant grade. Will be stocking up on these. The quality of this product is very good. I would continue to purchase it because it is more economical from here than other competing suppliers. These bus tubs are sturdy and easily cleanable. They are strong. We use them for dirty dishes and a few for our dough to rise in the cooler. The size is perfect. Good bus tub for the price. The cooresponding lid fits well. We like that the bus tub can be ordered in different colors for different applications. We ordered several of these 20" x 15" x 7" black poly bus tubs and we use them for storage and they stack (with lid) and store things nicely. These are heavyweight, hard plastic tubs. They fit on a standard metro rack and seem to be a very standard size bus tub. We use them for both dirty dishes and for wine bottles to be recycled. Very sturdy! These bus tubs are really nice. We use these to put our fresh vegetables in when we cut them and use them for meats. They are a nice size, strong quality, and they are really easy to clean. Great quality and good price! This tub works great for customers to place their used dishes, and for us to bus dishes back and forth. It's sturdy, nice-quality, and serves its purpose well. I use these to store items in the garage and the lids are a must to stack multiple bins. Very sturdy and a great price! The bins work great for storing shoes as well and the multiple colors make it easier to sort. I use these not to bus tables, instead I use these to marinate my meats. They are big enough and hold a large amount of meats. Overall I am satisfied with the purchase. These bus tubs are helpful, we like to have a whole stack to keep our dishes organized and in check. It's easier to pick these up then dishes individually. We use these tubs to store samples. 3 of them fit side by side on a 48" rack and provide perfect access for our staff to grab samples quickly. Typical black bus tub, super useful for all sorts of applications whether for food, dry storage, organization, dirty bin. I like getting them in black because they won't stain like the lighter colors will which give people the impression they are dirty even if they are cleaned well. Great value bus tub. The construction is sturdy and I can consistently use it to transport twenty five pounds of dirty pots and pans without any breakage. I bought 2 of these and love them for my event rental business! They are very heavy-duty and can hold quite a bit. I also use them after the pickup to soak flatware in while I’m cleaning other items. We use these bus tubs every single day. The are sturdy and easy to clean. They are light weight and hold plenty. Love these tubs. These tubs are very durable and trustworthy. Purchased bins similar to these in the past but not as thick as these which is plus especially when these are full with heavy dishes. First of all, these were an excellent value. They are the perfect size for what I needed, and best of all they were packaged beautifully so there were no scrapes or anything on the plastic. Perfect for buying a large quantities when you have a busy food and stuff which meant. Good solid bus bin. Fits on most under shelves of prep tables, and the black color keeps it looking neat when you go out into the dining area with it. So far so good. They seem durable have been holding up to use so far. Haven't had them very lock so hoping they don't start cracking. These tubs are spectacular! We don’t use them for bussing but instead for storage along with the corresponding lids. Brand new they come with a plastic smell but it washes out. Would and will buy again. We use these bins for bussing tables, fridge and freezer storage. For the use we get out them, they are a great deal. The handles are always the first to go, but when you are carrying heavy things, this is expected. I have 4 of these bins for dirty dishes and I love how sturdy they are! They have withstood a busy lunch rush and are easy to rinse out or throw in our dishwasher. The handles don't cut into your hand when you carry them which is also an added bonus. I really should have gotten more of these when I have a chance. One can tell that this will probably never chip scratch or die. I use it for my events to hold drinks. Note: If you cover it up with a tablecloth and insert ice no one will be the wiser. Great strong tub. I actually use these to transport and keep cool my cupcakes at market. They stack very well when combined with the coordinating lids. These black polypropylene bus tub is very sturdy and durable for the price. The handles can handle a decent amount of weight. Being black, customers can't see how dirty it gets. These are great products for a great price. I buy these for storing frozen foods to bussing tables and they work great. They are easy to clean and fairly durable. I wouldn’t recommend dropping them straight out of the freezer though, they break into a thousand pieces. This is a very good size, sturdy bus tub that allows me to move all of the dirty dishes from outdoor parties inside to the kitchen. Very much recommend! Your basic bus tub, works great for intended purpose. No sense in spending more money for comparable products. This one will do the job and save you money. Can’t go wrong! These bins are great, especially for the price. I got the matching lids so they are stackable which will be very convenient for me. They are much sturdier than I expected them to be. I use these bus tub boxes to hold all of our small pantry items, but they would also work great to bus tables with. Easy to clean and stack inside of one another for storage. This is the perfect bus tub at an absolute bargain price from Webstaurant. We have loads of these and they are great for bussing and storing. Sturdy and easy to clean bus tub, it has worked well for its purpose and they are inexpensive to boot. I would recommend these bus tubs. The Black Polypropylene Bus Tub, Bus Box have been so useful and versatile for us. We not only use them for busing tables, but they have been used as ice tubs for drinks, napkin holders when we are folding large quantities of napkins and a number of other items. They are also sturdy enough to carry vases full of water, which is nice. We use these on our farm for harvesting vegetables into, transporting products to markets, storage in the cooler...you name it. They are super sturdy. As a bonus for us, they fit 12 pint containers for tomatoes/berries perfectly! Love these. These bus tubs are such a lifesaver. We use these for just about everything and anything you can imagine in our high school culinary classrooms. They are sturdy and good quality and we just can't seem to get enough of them. For the price these totes are the best there made very well and they’re built to last I would recommend these buckets for any kind a restaurant . These bus tubs are great! Especially when it's so cheap for them. They are super sturdy and we will probably use them forever. I don't see us being able to break them. These black bus tubs are great. They wash easily, can handle a ton of food and dishes and sure make table bussing much easier. Very Sturdy. The black bus tubs are very sturdy and convenient for use in a bar/restaurant like ours. The handles are more comfortable than other brands we’ve used that have sharper plastic rather than the rolled edges and slight give that these have. We have had a few crack on the bottom, but very infrequently and only with a lot of heavy use. This bus tub feels sturdy with solid handles. It can be used for just about anything so it's worth having several around, not just for busing. I use this Bus Box to marinate large quantities of meat. I love it! Its so deep and I can easily marinate 50-60 pieces of chicken in it. Its a must have in my Kitchen. Perfect size bus tub. I like the black color because it doesn't stand out in an ugly way. We've been using them for 4 months now and none have cracked or anything bad like that. These bus tubs are the economical choice for keeping tables clean. They stack easily if you have more than one and are very simple to clean. Great product! Very sturdy tubs, great for washing up in or bussing dishes. We use this size as washing up tubs and for the most part, they're great. However, afyer 5 years, we have noticed that the 2 tubs reserved for a bleach sanitizer solution now appear to release bits of plastic into the water - probably a result of constant contact with the bleach, and not a product fault. The walls in this box are thick and firm, but the bottom is a bit flimsy. It seems like it will brake fast because I carry heavy items in it. Bus tubs are essential for us. We use them as our three compartment sink at mobile events. We also use them for storing onions, sweet potatoes, etc in our dry storage area. We use lids if we want to stack them on top of each other. This bus tub is great. It is sturdy and durable and also easy to clean. The design seems like a great quality and I expect these will last for a long while. Nice, sturdy bus tubs. We use these all over the restaurant to collect dirty dishes. They can hold a lot of weight and are not easily broken. This Bin is very useful for food prep, storage, ice etc etc etc... we use these bins for so many different things in the restaurant! Great Quality! These bus tubs have a fairly good price and came in great condition. They seem like they're made of quality material and will last me a while. we purchased these for our deer meet processing they are a little lite but work great for the price and black cleans up a lot easier then gray. I got this bus box because it seems affordable and looks strong. (And this product is strong in real life) So I would like to recommend this product. This bus tub is of good quality, it’s definitely a durable plastic and not like some cheap bus tubs out there. Great price as well! I love this product. It is perfect size for the bus cart that i ordered together with. Its easy to clean and light weight so i can easily carry it around. Great product for great price! These bus boxes have a number of uses. We always have quite a few on hand as you can never really have enough of these. Perfect tool to use on any bar, restaurant size for use in small restaurant or food truck kitchens, perfect for carrying dirty dishes, glassware and even preparing food. Used these tubs to hold all the nut, bolts, nails, screws, odds-and-ends in my recent shop reorganization. They are heavy duty, easy to grab and pull off the shelf, and deep enough to hold several layers of containers. This black kitchen bucket is the best product I have ever purchase. Is really strong and easy to clean. I love this product. I recommend it to anyone to use. We use these for so many different purposes. Bussing, storage, catering, cleaning..etc. I would recommend to anyone in any restaurant. these are long lasting and the black color hides any scuffs that may occur. Nice size for carrying things. I am using these for cleaning dishes for my concession business. These are good sizes to carry dishes and many other things. Very high quality and would buy again. one of the most durable containers out there. we use our for so many things . comfortable handles make for smooth transfer of even the heaviest loads. This 20 x 15 bus bucket is the perfect size for our kitchen. The bus bucket looks good, and is easy to work with. I plan to order a few more. Our staff love the option of a bus tub. The attached handles on the black bus tub make it easier to carry a large/ heavy amount of dirty glassware. I got these tubs by accident. I didn't realize they were the tall tubs--so they don't fit under my bar machines. They are really great quality, so I took them home to use them for gardening. Good, sturdy buckets, we use these to tote our 16oz mixing glasses. The lids fit well (sold separately) and the handles are easy to grip. Solid hardworking tub. I am utilizing them mainly for moving ice from one location to another, and then service as cold storage "boxes" for salad dressings during service. OMG! I just got these and I'm amazed, I bought them to see if they would help me with my storage on my cabinets, they are great! I am ordering extras to organize my garage too. The 20" x 15" x 7" Black Polypropylene Bus Tub was a very nice purchase. These are very durable and nice and deep. I have had and used mine for 4 years now and have had zero issues with them. Plus they have way more uses than just being a bus tub. I use them for so many things. Great purchase! Use it for bussing tables, holding foods, bring things to kitchen storing food, it has so many uses. Easy to clean, fits in dishwasher, and makes life easier. We use these tubs for busing tables. They hold a lot of dishes and are easy to wash out and clean. They hold up well to heavy use over time. Sturdy, heavy duty bus tub. Great for both kitchen and front of house usage. Fits in standard dishwasher so is easy to clean and holds a good amount of product without buckling or cracking. This is a great tub for all your busing needs. And what a great price. The quality is comparable to others that a twice and three times the price. Solid bus tub. We use it at our coffee and tea shop to allow customers drop off their dirty cups and dishes. It is the perfect size for a mid size cafe. This, by far, is the best tub purchased for the money. It costs less than most I have found and it is of amazing quality. For the price I was surprised with sturdiness and durability of this bus tub. I will be ordering more of these to help keep dirty dishes in. Very useful! They are sturdy enough to hold a lot of dishes. We also use a few of these for storage in the kitchen to help organize. Can never seem to have enough of these! This is a nice looking bus tub! Light weight and very easy to clean The low profile design makes it easy to use, dump and keep clean. These are good quality bus tubs for the price. They are deep and feel heavy duty compared to others. The color is great for long term use. 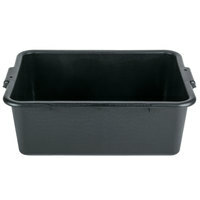 This medium size black bus tub is very useful to use for almost anything. Be it carrying dishes from the dining hall to kitchen or transporting other things. It is very durable and has been used over and over again and still functions as the day we got it. We definitely like this one a lot. these are great. very cheap. and they are heavy duty! A lot of bus bins break though on the bottom because they are thin plastic. He's are perfect for him and skill restaurant to bus dishes into you can fit a lot in the hold up very good you can also use different things like seafood in them . These are less expensive and same quality that you will find in your local supply store. We have no complaints and probably only wish they had a larger size of these. Bus tubs are essential in our bakey and cafe for many uses. We store ingredients, tools, towels, and other supplies in them. They are also great for washing dishes or other cleaning projects. Standard black bus tub. Great use to clean and stack cups, glasses and dishes. They have handles so it's easy to carry especially when you have a full tub. It is plastic black color, well built and durable, only thing not like is doesn't come with a lid . exactly what I needed . Good purchase . Bought this to use as a storage box in the garage. The box is sturdy, easy to carry by the handles, and I iove that there are other color options. Black bus tub. Its does what it says. Its offered at a great price here. use it for bussing dishes or for other cleanup. Seems durable enough and we hope to get good use out of this. We use these to put our bread in for our paninis after we slice it. Works great, easy to clean. Has a million other uses. This tub is great for putting scrap books in and for storage. I bought a bunch of these and I dropped one and it didn't break I love these thank you webstaurant so much for this good offer. I like the size of this bus tub for plates. They stand up great so far. They going through a lot when we use them 365 days a year 3 times a day. Wow, who would have thought a plastic tub would be so useful. I love using it to clear all the dishes so that I can wash everything in the sink without having the sink filled with dirty dishes . Great bus tub pans for many uses. Thick plastic construction should hold up for many years. Includes a hole in the handle great for hanging it up for air drying. Heavy Duty! I ordered 2 of them for our wedding for all of our dishes to take home and throw in the dishwasher, they will work out great! You cannot find a better bin for the price. These are functional, ergonomic, durable, and affordable. It's worth noting that, with the way my package was shipped, two of these containers arrived broken; I am not sure who is to blame for the defects but the WebstaurantStore customer service took care of me and I will be re-placing my order for a couple more of these soon. I bought these to hold all of the silverware I bought for my wedding. It is very sturdy and simple. Each one held over 200 pieces of silverware for me. This solved a huge problem in my large household - where to put all those dishes before loading the dishwasher WITHOUT putting the sink out of commission? Now we just rinse our dishes and toss them in a couple of these bins which are situated on our counter to the left of the sink. The best part is if company comes by, we throw the accessory lid on top, stack them, and you can't even tell there are any dishes at all! I am so much happier since buying these. Huge daily eyesore (and stressor) resolved, and for less than $5! Very nice large and well built bus tub. Aso perfect for use to store your cleaning supplies under a sink. Nice hard plastic black finish gives the product a sharp look as well. This works perfectly in my coffeeshop as the bus bin for people's dirty dishes. I didn't even get a chance to make a sign explaining what it's for, but that was fine because people figured it out immediately. It stays in the corner by the condiment station so that it keeps things organized. These bus boxes are strong and durable. Worked well for a three sink option before our stainless came in. The lids also are strong and seal great. This is a sturdy bus box. Great value and washes very easily. Not only used for dirty dishes. Great for transporting items when doing catering away from home. Great price for bus tubs, they arrived as expected and are coming in quite handy in our new restaurant. They stack nicely and appear to made of durable plastic. Excellent tub!! Very sturdy design and holds a lot of material. We purchased a dozen of these to hold orders for processing and we are probably going to need more very soon. We have lots of these bus tubs at New Deli, and we use them every single day. They hold lots of dishes, aren't way too heavy but are still durable, and they wash easily. We use these all day, everyday. They are great for transporting or storing dirty dishes and are easy to clean. Very durable, highly recommended for any food establishment! You have to have bus tubs. These things can do everything. From cleaning a table to do large batches of prep. This is a great item. Great price especially if you buy in bulk. Standard bus tub and will be good for my dish area and fits on my utility cart. I love this bus tubs! Not only helps me organize my kitchen gadgets in place also serve as a transporter to one place to another. They work well but be careful to sit them down too hard with a good amount of weight in it, I bought 24 of them and one split up the side. We purchased several of these tubs, hoping to use them to bus the tables at the banquet, however, we found out they have a lot of uses. We used them for everything, they hold up great, and easy to clean. High quality that has lasted for every day use. We buy them in lots of 10 and have several in use at all times throughout our two restaurants. It is an excellent product! I like it a lot. I am glad that WebstaurantStore carries this high quality tub. The only drawback is that the lid does not fit tightly on it; otherwise, it is perfect. I bought two tubs and two lids, but they do not serve me as well as I wish. This bus tub has saved our business from having to constantly walk back and forth to deliver dishes all the way to the sink. It's easy to clean and very discreet. Bus tubs get a lot of abuse and this is cheap to replace. So its a 4 star in that regard. Its not a forever product, but its cheap enough. Economical choice. These things go through a lot of wear when you use them for dishes, so for the low price, i'd say it does pretty good. Great heavy duty tub that should hold up for a long time. It is very thick plastic and has built in crazy handles that seem very sturdy, I Will pick up a few more of these for sure. Does 20 x 15 x 7" bus tub is really nice it's black so it kind of hide some of the dirty stuff it works great for walking your dirty dishes from the table to the sink. This is an extremely sturdy bus tub. Heavy duty plastic construction with reinforced rim. They arrived in perfect condition with super fast shipping as always. Put these on a bus cart. Or just a regular cart. Works great when your busy and need to get the dishes out of the way. Not how you'd expect these tubs to be used. But they work wonderfully well!!!! I use the bus tubs to transport food to/from events at my church. They work exceptionally well to haul 9x13 stacked or gallons of tea. Good tub, stacks nicely with lids however the lids don't snap into place they just rest on top of the bin. Great for storage and organization. This product is very sturdy. It was very easy to wash. The quality is very well for the price. I definitely will buy it again and recommend it as well. This bus tub is very versatile. Great for shredded cheese and vegetables for a pizzeria. Easy to clean and holds up to being tossed around in a busy kitchen. Good, study bins. I am sure they would be excellent for their intended purpose. I used them as bins for my pantry and drawer storage to keep everything contained. I love that they are uniform size and very inexpensive compared to other drawer organizers. This is a very durable and easy to carry around. No issues with it yet and it has been 4 months. Best price around. Highly recommended!! Very Durable, reliable and hasn't punctured or broken yet. The price is great and I bought assorted colors just to mix things up a little bit. They are all stackable and easy to haul dirty dishes and glasses to the kitchen. Black is for general things. But I am going to get another as I found these bins are sure to be useful in my garage also. These things are stackable and also have a rack specifically for these bins to help organize your needs! cheap and good product for all restaurant owners , highly recommend ! this is a must have ! it is a all function tub ! We used these bus tubs all the time for different purposes. You can't beat the quality for the price. These should last nearly a lifetime as expected. We bought these bus tubs to separate recyclables at our annual Greek Fest. They are strong, sturdy, and easy to carry and clean. They also keep the recycling area neat looking. These bus tubs are a great investment. They are durable but strong for the price and have sturdy handles. They stack neatly when not in use. Quality bus tub with solid construction. Very happy with this purchase. Bought several fits my needs in multiple areas from dishes ,food to storage. Easy to clean and keep clean. Excellent tub to prepare food or use it to place dirty earthenware, facilitates transportation and handling of items and food. Good quality material. I use it every day. These bus tubs are very durable. We ordered a lot of them to use to clean our tables off with. They can hold a lot of dishes. These tubs are great for everything!!!! Storage, prep, etc!! Great for hauling back and forth between the commissary and my food truck! Tough and durable! These bus tubs are very flimsy. Lost a stack of dishes using these. These can be a little stronger if using to bus tables. I 'm using now to store product in freezer. A great, inexpensive tub that we used for many purposes. With the lid, it was perfect for transporting little odds and ends to our dinner function, and then we filled it with ice to use at the bar. I would definitely recommend washing it before use, and you could smell the off-gassing when it was first opened but that went away soon enough. We can always use another bus tub. They are a great value and good construction. Handles are strong enough to carry with multiple items in the tub. These bus tubs are durable and good looking. They serve many uses in my kitchen! I have always used these and they last forever, amazing deal for the price. A good bus tub. Not the highest quality but gets the job done. Good handles. The bottom could be thicker because its a bit too flexible and will probably eventually be punctured and start leaking. The edges are a bit rough on mine. These bins are a great size and very heavy duty. They can be used to haul around pretty much anything and still look as good as the day we bought them. Really good price on these and aren't your standard gross brown looking food service bus tubs. Give a nice, sleeker look to your back of house. This tub box is great. It is sturdy plastic and carries a lot of dirty dishes. The dark color is nicer because it holds dirt better. These bus tubs are durable, cheap, and very useful. I keep a few in the kitchen and one outside for guests to bus their own table. Also useful to carry items for restocking. We use these to bus tables and store certain items overnight in the walk in cooler (of course labeled separately) The lids are not locked in air tight but they are durable and wash up very easy. We use these daily to clear off many tables during our buffet. I like the 7" one because you can load more in there without it overflowing and in view of customers. Durable, versatile and priced great. Use this to tote ice or as a standard bus tub. Handles holding up well and fits inside standard dish machines. Bought several for our bar for our diy wedding. Used these for wash stations, bus tubs and for ice staging. Very versatile. Good quality for the price. The 20x15x7 bus tub is sturdy and gets the job done for an affordable price. It's a good size, is easy for our staff to carry and stacks fairly well with other tubs of this size. These hold up nicely for the job which we are completing. We are using multiple of these for Making large batches of salsa and they work perfectly. These bus tubs are just wonderful. We use hundreds of them everyday in our company. We operate large group camping tours across the USA and camp all the way along. These tubs are the perfect size and weight to was dishes for groups of 13. These tubs are the perfect size. Light weight but durable material makes them stand up to abuse and keeps them looking nice. Easy to clean. Nothing beats the value for these silverware tubs. They are durable and easy to clean. The handles seem to hold up to weight well and are easy to carry large loads. Work great as bus bins or ice trays for cold-held pans. They are inexpensive yet very durable. They are also the perfect size and very spacious. I use them to organize stuff in the garage and patio area. These are perfect. Very study and solid. Handles are not too flimsy either. I just wish I would have purchased more and saved on shipping. These tubs are great for collecting the dishes to bring to the kitchen. The handles are great and the tubs don't really bend when they are full. Very handy to have a few of these around. Great value for carrying dishes and waste. Not great for carry liquids as the bus tub lid will not keep liquids from coming out of the side. This poly bus tub is the way to go. It's sturdy, durable, easy to wash, and the black color looks good even when full of dishes. Why do tubs disappear? I don't know, but when they do disappear you can confidently replace them with this one. It's strong and cheap. In other words, it's perfect. These tubs are great for storing or washing. We received a couple broken ones and customer service shipped replacement tubs within 2 days!!! We love Webstaurant.com! I thought that these bus tubs would be flimsy and cheap due to the price but I was wrong. They are strong and sturdy and are comparable to others that are 10x the price! I'm very happy with these bus tubs. They are sturdy and are nsf rated. I use them in conjunction with bus tub lids I also found on here for a affordable way to store food. Already cracking/seeing a lot of wear. We are a very active and busy kitchen, but it's been two weeks so I'd expect it to hold up better. Scratches also show really easily because it is black so be wary of that! Seems to be your standard bus box. Great quality for the price paid, can be used for many things. Will definitely be buying again soon. Perfect for our restaurant. Thick, strong polypropylene bus tub is wonderful for clearing tables and stacking dishes. Nice size and should last us a long time. This is a very heavy plastic. The containers are very thick and durable. They will not bend, crack, or lose there shape over time. I'm very happy with my purchase. The black bust tubs work great! I was a little worried that they would be a little flimsy at first but they have been working like a charm. The black is also much nicer to look at then the brown and hides dirty plates nicely when walking by customers. This bus tub is wonderful, it's heavy duty and it's lasted for a long time. We use it every day and it holds up very well. We ordered this for our restaurant. We use them for storage in the kitchen. It is sturdy. We will order them again if the need arises. Perfect tub for our business. It is made of strong material and holds a lot of items. Easy to clean and stackable for space saving. By far the best price on the market. As low as half the cost of other retailers online and locally. These are very durable and great quality. Long lasting as well. These are inexpensive but get the job done. A restaurant can never have too many bus pans. These are easily cleaned and can just be run through the dishwasher. I would recommend. We use this bid tub for one of out fruit and vegetable grant programs. These tubs are durable, easy to transport, and are very versatile. This item is decent. A sturdy durable bus box that has a good holding capacity and is tough as nails. Good value for the money. We've gone through A LOT of bus tubs in our business and this one is my favorite! Unlike some other brands, these never break! Even loaded with silverware, they stay strong! We use these to hold bags of fries, extra towels and we also use them in the dish room. Great Price so use them for everything. Strong and sturdy! Really holds up under weight of water and dishes. I use this in my commercial home kitchen as a replacement for a 3rd sink for sanitizer. NSF certified too! Use these for cheese tubs and they are very durable. The handle don't seem to have any trouble when full. They can hold a lot of weight and take some abuse. This bus bucket as we call it holds so many things it has multiple uses outside of just dirty dishes and pans will get more. Excellent Bus Tub ! We purchased many of these and use them every day - We use some as Bus tubs and others in closets to hold additional supplies that we don't want loose on shelves. Don't change a thing about these, they can carry considerable weight and have no trouble - they are that durable. Even the one's we use everday as Bus Tubs look like brand new, the size and price are excellent. Don't let the price fool you.....This is a very heavy duty tub. It is very well made and sturdy. We use this at cook outs and outdoor parties so guests don't have to take dishes inside and I can keep dishes in one place and enjoy the party!! Very heavy duty. Perfect for dishes or proofing dough or whatever you see fit to do with a bus tub. Standard size. Very fair price. It gets the job done! Bus bins for so many different uses! You can use it for storage, dishes, even for proofing dough, as long as it's super clean! Super versatile bus tub! These tubs are nice and large and very durable. We use them all day in our coney hot dog restaurant with no issue. Because they are so large sometimes they can get a bit heavy for our employees but no one is complaining. They are far better that our previous tubs. Very durable. We have used the same bus pans for 2 years. Anyone in the business knows that bus pans crack and break all the time. This bus pan is a beast. Great for busing tables, storing food , or even mixing food. These inexpensive bus tubs have many uses and are worth every penny. May crack after a lot of use, but cheap enough to replace. Although this bucket is designated and designed to bus dishes with. We use these for breading buckets for our fried seafood. The shape and size is perfect to hold flour and curved edges on the bottom give you that comfortable feel to fully bread your seafood and other needs. You can't beat the price. I ordered 10 of these! Great product they are very well made, and cheap. Exactly what you find at all restaurant's. I have used some for gardening and even paint jobs they are useful to have. We started using these bus tubs to separate out merchandise before stocking on our sales floor. Since we convert to these tubs we no longer break items, pieces of sets are able to stay together and this has resulted in increased sales. Customers appreciate that we aren't taking up a whole aisle with a large cart because we can walk the aisle with a small bus tub and it's more manageable. Best price around, especially if you are buying in bulk! These tubs are great! Good price, sturdy & durable. Perfect for bussing stations & stocking dishes. Great size, super happy with this purchase. Can't beat the price for the product. These bus tubs are very useful. We have found uses for them besides busing tables. We throw our soiled linens in them to transport them to the wash as well. They are sturdy and large. The 20" x 15" x 7" Black Polypropylene Bus Tub, Bus Box is a great versatile product. We use it to store cups, crockery and to collect dirty dishes from the dining room. It's the workhorse of the kitchen. We use it to collect dirty dishes. We use it for holding ice when we have special events. We store clean rags in it. It is easy to clean and store. We will definitely order it again when needed. A definite must have to put dirty dishes in prior to ware washing. I also have one that I use to put ice in to keep food cold during service. This bus tub is perfect for my needs. It holds lots of dishes and easy to grip handles. The bus tub is affordable, light weight and durable! Awesome bus tub that is big enough to put everything in and not be too heavy. It can be ran through the dishwasher if it gets dirty. Versatile and useful, as expected. The tub has plenty of space inside, good quality handles, and functions for a variety of carrying uses. The plastic could be easier to clean (shinier), but, still. This bus box is large and perfect for bussing a few messy tables. I use these to store clean utensils. For some I use as a storage container. For the price of these tubs you cannot go wrong they aren't quite as strong as a few that I have but hold all the weight that I need them to. I ordered These as shelf organizers for home use. Since they stood up to heavy use at my restaurant. And of the four i ordered two are broke on the corners. I guess it was the carriers poor package handling since the packages weight was 50 Lbs. And was pretty beat up. We use these for our venue cleanup service. They are great and hold a lot of dishes. The price is excellent. We were purchasing them from another site at a lot higher price. These bus tubs are great quality. They hold a lot of dishes. We have three and use them a lot. We have not had any breakage. Can beat the prize and quality of this plastic black bus tub. Easy to put all your dirty dishes and some left over food too. !!!! Works perfect for a bus boy tub! I like the black color...there's no staining to worry about. The material is super sturdy and is a little thicker than some other ones I've seen. We will definitely be purchasing these again. Love the deeper size of these tubs. We use for food storage and mixing, and not for dishes. Paired with the lids, they are great for making large batches of things like cole slaw! Great bus tub for the money. We are using our olny for glassware but deep enough to do the job. Would definitely purchase again and again. Very versatile, durable, dependable and reliable. We use these tubs for everything! Ware washing, clearing tables and soaking items for sanitizing. Great product at a great price! This is one sturdy bus tub at a great price and size. I ordered this because my was tub cracked and we needed something strong and able to be used for other reasons later. This bus tub goes right from fill to our temp. wash tub! What a great buy! These 7 inch black bus tubs are very very durable. These things will be around for awhile. I am Definitely glad I made this purchase. Great tubs. They feel very durable and I think they'll last a really long time. They are great for hauling large quantities of ingredients and supplies. Very durable and great quality material. Easy for our busboys to lift over their heads as they carry full tubs through large crowds of people in our bar. We use these for more then just bussing tables. They are handy for storage, and they are nice just to haul things around our restaurant. There's not much to say about a bus tub but I will say, I saved for everyone I ordered here rather than other popular retailers! Nice black bus tubs! They are priced cheap and clean up very well. I thought the quality wouldn't be so good since they were priced so cheap but I was wrong. These bus tubes are great for transporting food from kitchen to walk-in or freezer. Easy to clean, durable, many uses, a must for every kitchen. I don't think we can ever get enough of these. We use them all the time for all sorts of things. They're sturdy and just the right size. Just what we needed. A great quality bus box at a very very affordable price. The quality matches that of the bigger brands. Fits perfectly on the Choice brand economy cart. With our new shelving, we wanted to maximize the space in our soap studio and that item became our favorite. We had to order more. Been surprise how sturdy they are for this cheap price. Seriously, I found the same item for more at local restaurant/business suppliers and each time, i'm so glad that I ordered from here. More than half the price and great quality. Smart buy. Le plastique est solide, la qualité est vraiment incroyable pour un prix si minime. Très pratique pour gérer l'espace sur les étagères de notre studio. We use these black plastic bus tubs to store onions on our shelves when we receive them in bulk. No more onion skins falling out of the bag and onto the floor! We use these a lot -- for making big quantities of salads, to rubbing down different cuts of beef and pork. They are versatile and stackable! The only negative is that the bottoms can be brittle and crack if you have something on the heavier side in one and they are dropped or not put down as gently. Use appropriate care, and these can be a great kitchen help -- not just for dirty dishes! These are not as sturdy as the Rubbermaid, but for the great Webstaurantstore price you get your money's worth and then some. We will get these again for sure. Performs well. has held up under your resgular restaurnt abuse. We use it to hold dishes coming back from the dining room. Would buy again and recomend . Good bus tub. It doesn't feel cheap or flimsy. The texture is nice, which helps it stay a little sharper looking. I have other brands and these stack with them. This bus tub was better then i expected. I use it in my seasonal food wagon. We pile up our dirty dishes in it. After its full we return to the commissary and wash them all up. This bus tub was very affordable, has a large capacity and is very easy to clean out. I have used mine for over a year now without any problems. Based on price and durability I recommend this product. These bus tubs are versatile and an exceptional value. They are strong enough to hold quite a bit of weight and feel strong in the handles. We will be buying more of these and probably the matching lids. I bought these for a grocery store to display produce sure as veggies and fruits and dried products. So far it's going on two years some handle up to 50 lbs and no complaints. Easy to clean and eliminate odors. Will buy again. Great sturdy bin for dishes, washing produce, collecting utensils etc. Love that they are NSF certified so we can use for food! Will definitely be buying more! Cannot beat the price for the quality of these bus tubs. These are restaurant quality tubs and can be used for multiple purposes. They are light in weight and sturdy. Bus buckets are essential for a restaurant. The price of these buckets are very tough to beat. Amazing and sturdy quality. They can hold a lot of weight as well. Good sturdy tub made of quality material. These tubs work well for soaking since they are deep and are sold at a very reasonable price. These tubs are made very well and are incredibly durable. If you clean them they maintain their color and look nice in dining areas instead of some i've seen in other restaurants. These bus tubs are a great price but are not as thick as some others. We have had a couple break near the handles but four or five have been in use for two years and are still going. I don't use these as bus boy tubs, but for organization. They make great containers to organize small bottles that will fall through the stainless NSF shelving. For the price, you won't be able to purchase regular storage containers. We have a ton of these! we use them in piles, so that when one goes to the dish pit, there is another waiting for dishes. They are good quality at a great price! Perfect size for busing our glassware in the taproom. Sturdy, can hold plenty of weight, easily carried. Great multipurpose item that will not let you down. Washes easily. This item is not just any bus tub. I also use this item to mix large amounts of food rather than big bowls. The price is definitely excellent. That tub is of surprisingly good quality for the price they sell it. You can stack a few and even carry stuff that's relatively heavy. This is a quality bus tub that can be used for many different tasks. It is great for storage and is easy to carry without fear of spilling or dropping. Black Polypropylene Bus Tub - 20" x 15" x 7"buy 10 at a time you will love for the price. very nice I would buy over and over. Great for restaurants, bars and coffee shops to hold dishes, etc. ! We use ours to bus tables at a small venue and they are very sturdy and nice! Very necessary for any dining room. Very strong and durable. Holds a lot of dishes and glasses. It is very easy to carry and easy to clean after multiple uses. A caterer can never have too many bus tubs. We use them for busing tables, but we also use them for transporting supplies and food to our client sites. We dont throw plastic away and we needed something to gather up and hold empty cans and bottles. Thats why we got this, and thats what it does just fine. Heavy Duty at a great price. A million uses, and you cannot afford to be without a few extras. NSF listed too. A great product at a great deal. Nice sturdy tub, I have found multiple uses for them. I use them on my carts, in my cabinets to hold pan lids and even to transport food items. I only wish I had purchased them years ago. I'm sold! I love these tubs! they are so convenient in a restaurant dining room or kitchen. I use these at work to clear tables and it makes the process so much easier. Great value and great product. A nice heavy bin for almost any use. I use this for our fries - color coded for different uses. It's larger than I'd consider normal, but a nice weight. There are cheaper places to get bus tubs, but these are good quality and delivered, so I am not complaining. The handles are a little weak. Great product and Great Value. We are so glad we can order these through webstaurantstore. Standard bus tubs are needed in our restaurant all the time. These tubs are very durable. They were used for a wedding reception to bus tables. They could also be very handy for a number of hauling/storing items. We use these tubs/lids every day in our kitchen. We store 100's of batches of dough in the tubs and it makes for an easy storage and accessibility for us. We purchased many of these bus buckets and the price point of this one is so much better than the others and truthfully I think the quality is just as good. These are very good sturdy bus tubs. The ones we normally order are way thiner and have cracked very easily. These seem to be holding up very well. These bus tubs are such a great value. They are just great to have on hand and such a steal at this price. I will buy more!! Great value for the money. It does it's job well. And they are not just for bussing dishes, I also use them to store other nick nack items. If all you need is a cheap plastic bus tub then this is the way to go! They are very inexpensive and serve their purpose well. Wish they were a little less flimsy, but they are still good. These are extremely durable and we are very, very pleased with them as well as the covers that we ordered to fit them. Some of these tubs have been pressed into service for use in our hydroponics system, for growing salad greens. They are so much heavier than any regular totes on the market. I am ordering more today to add to the hydroponics system. Cheap utility tubs that work great for storage or bus tubs of dirty dishes. Several came shipped broken but they threw in extra to make up for it. The handles will break easily if carrying too much weight. These Black Polypropylene Bus tubs are wonderful. They are strong and durable and the size is perfect for my cafe. The 7" depth is great for holding many dishes, glasses and flatware. I really like these tubs. Honestly, I thought that they would be a little more flimsy, but they're you're standard, sturdy tub that can be used for whatever you may want. I haven't put 50 pounds of dishes in them yet, but they feel like they would take it without any problem at all. These are the quintessential tubs you see in the back of any resaturant. Very sturdy, the black does not show stains-- what more could you ask for? Excellent purchase. These bus tubs are simple, easy to clean and serve their purpose. They've been dropped a lot and no cracks have happened. Very pleased with this. The Black Polypropylene Bus Tub is a great way to transport clean and dirty dishes. In fact it has come in useful for transporting all types of products. The polypropylene is easily cleaned and doesn't stain. The bus tubs suit their purpose. They are durable and easy to carry even for the youngest/non-experienced of bus help. They can carry a lot of stuff and are very sturdy. We use these for soaking! The ones with the side tub work for the wait staff but these are perfect for in the actual kitchen area. Light weight but strong. We use it for many different tasks, form picking berries and cherry tomatoes to washing root vegetables. It also works well to display produce on ice at the farmers market. bought these because of the price and figured if they didn't work out they were cheap and could toss with no real loss. WOW am I amazed of the quality! Let me begin by saying that I think these bins are outstanding. When I was looking for containers to start growing hydroponic produce, I didn't want to use containers from a national chain store that weren't designed for use with food items out of concern for chemical leaching and/or contamination. Enter the black bus tubs. These tubs are made to stand up to daily abuse in a restaurant, including washing through high-temperature dish machines, so I don't worry one bit when I clean these with vinegar and hot water. The plastic is sturdy and easily holds a couple of gallons of nutrient solution without worry. This is great for basic organization - we use it to hold our garbage bags, some food products (when we only have a few left in a case) and even a catch all for smallwares. Works great. I would definitely buy these in bulk, they'll really come in handy for just about anything. We use these buckets for storing our mozz. cheese, They are very sturdy and should last several years. Price was also a factor and these are below most places! Perfect for bussing tables or carrying items to and from events. Holds up well in any event or environment. Good sturdy item and easy for anyone to carry. Very strong bus tub. Perfect size. Would stick with black rather than the gray. Can use for just about anything, doesn't have to be used just for dishes. Can't beat this product for the price, dont spend four or five the price for the name brand tubs, high quality, very stirdy and perfectly sized!!! I have been in the restaurant business a long time and this Bus tub is very strong. In my opinion one of the best.Thanks WEBstaurant!!! The Black Bus tub2 were deep enough to hold the 10.5 inch dinner plates that I used for my wedding this past weekend also very sturdy. Great value! These are great large tubs for soaking dishes or carrying dishes around. They also serve very well as part of a triple tub washing station for camping trips. And the price is hard to beat. These double as a washing up pan, bus pan, food prep pan, you name it. And it cleans up like a charm. Did I mention it is so reasonably priced you can have more than one. These were tough and rugged and were really really helpful for moving things around. I had actually used them to create another makeshift triple wash setup for my bartenders. It seems kind of simple to review a plastic tub, but in general I can't take away any stars from this product. Bus tubs are very handy for clearing tables, but they are also great for storage and organization. We use them to hold spare clean utensils, towels, packaged ingredients, and more. These are simple, but effective and a great price. There is a nice depth to these 7 inch pans. Holds lots of glassware as well as plates etc.. Also they are extremely heavy duty. The black bus box is great. It is sturdy and well made. It is great to carry dirty dishes to and from the kitchen area. We grow many vegetables and fruits for our food preparation in the shop. We can fits lots of produce in these bins, then use them as carrying bins. I like the 7" deep bus pans. We use them for dirty towels or to store things in. We also have the lids so we can stack these pans. Good value. Have held up nicely in a pretty abusive environment. Can't beat the low price and high quality of these bus tubs! Would purchase again. Good quality. Was perfect at my Tasting Party. They aren't that heavy and ideal for light weight items such as cutlery or saucers. Not bad. These tubs are a great value. They come in handy for so many uses including food prep and storage. Among other things, we use them to store grated cabbage for slaw. They are easy to stack and store with lids, and the handles make it much easier to handle than the large Cambro containers. Not to mention, they are so much cheaper! Every spot needs these bus tubs. We use ours to proof bread in and they work great. You can purchase lids as well and you have a great place to let bread rise. One of my new favorite kitchen tools. These bus tubs can be used for anything from bussing tables to food prep, to storage and transport. Very versatile. Glad we purchased the oversized height tubs versus standard ones. One piece, molded plastic design with handles built in to make carrying easier. Great value for the price. Highly recommended product. Hello, The price was just alright. not cheaper than others. the product is good for using in my kitchen. overall, the product is very good. we needed this very badley, and it is much cheeper then store. very heavy duty plastic, great product. and is very reasonable. great in value. Amazing bus tub. We use it for storage mainly and they can hold a ton. When we have to go to an event for our job these buckets come with us and it only takes a couple to hold everything. Great bus tubs and a great value. I couldn't believe the price, then when we got them i couldn't believe the quality for the price. We use them for holding our freshly shredded cheese. expected something sturdier, area around handle cracked first time we used them, next time I'll buy heavier grade, we trashed them after one use, not worth the money, pure junk. I just got my new Black Bus Tubs and i love them. They are so sturdy and the price is great.Thank You Webstaurant I am aways happy with everything i purchase. These are much heavier than the ones we have been using, plus the price is much less, can't beat them when you need to stack and hold in fridge. This bin is the perfect size for not only dirty dishes, but also for storage. We use these bins to store lids for our other containers, as well as our shredded cheeses. These bus tubs are great for anything. Very durable and worth the price. Almost every establishment could use a few of these laying around! nice deal! These bus tubs are well made, strong and durable, made out of high quality plastic. They can easily be filled with a load of dirty dishes and then carried without fear of the tub buckling or cracking. I love bus tubs for all sorts of applications. We store veggies in them in the walk-in, frozen food in them in the freezer, wash food in them, thaw food in them... They're our most useful container in the kitchen and so cheap, too! These high side bus boxes make great storage boxes for our deer processing business. With the volume discounts, you can not beat the price. We use these everyday and the quality is first rate. This bus tubs are great. We use them for food, and they hold the ribs, brisket, chicken wings great. We paired them up with the lids to increase space in our cooler. High quality bus tubs, good price per unit. Withstand heavy use in a restaurant/bar and still look nice. They get the job done well and didn't cost much. This is a great high density plastic black bus tub. It is waterproof and the handles make it easy to carry heavy stuff a good distance. Exactly as described. Perfect size for carrying up and down a flight of stairs in our Community building. Sturdy and easily gripped. We went ahead and ordered more of the same, as the price was good. We use the tub in our restaurant for pulling BBQ pork. The bus tub is heavy duty & built to last for years of daily use. I have used these tubs for almost a year. Sturdy and held up to abuse. I would buy them again if I needed to order more. These are great. I use mine to hold Corney kegs (2 to a bin) that I ferment beer in. These catch all of the spill over. Extremely versatile! We use them to take from table to table and clean up the tables or use them in the back of the store to hold our cleaning supplies! Great size bus box! This tub is heavy duty and cheap! What else can I say? It holds a lot of dishes, utensils and cups. Busting table made easy because of this ! You can,t have to many tubs at this wounderful price, a verity of uses ,Bussing tables,storage,light weight easy to carry,stackable.Great for home or restraunt use. this high density black bus tub is a multi use great product. we use them for a ton of stuff. from soaking silver, transporting dirty pots, and bussing tables..super strong and wash with a snap. I use these tubs to proof and ferment my bread products. This allows a lot of room for bread to expand and thankfully the bread does not stick to it. I use three of these for washing dishes at an outdoor venue. They are durable and easy to clean, while still being light weight, making them perfect for travel. These high density bus tubs do more than get the job done, they get it done without breaking the bank. Longest lasting tub that I have used to date. Takes plenty of abuse. Buy some now. You wont regret it. These high density bus tubs are really really great. They are not the flimsy ones that do not hold their shape.These are rigid and strong even when full. Great price..better then that, it's cheap, but of better quality. You will like this product- but love the price. Buy a dozen- how can you leave them there at this price. These black bus boxes are very reasonably priced and can be used for a multitude of catering purposes. We use them to bring supplies and food to locations. Covers also available. These tubs are sturdy without being really heavy. I have a number of these that I've used on shelves for storage. Nice and easy to pull out and plenty of room for mixer attachments, extra small ingredient storage, as well as for plastic bags, wax paper, and cling wrap. Great storage product! Has multiple uses: dirty dishes, marinating meats, vegetable storage and more!! Great for organizing equipment in the kitchen as well as organizing ingredients in a walk-in cooler! It is wonderful to have these bus tub in the kitchen. It is a multipurpose tub, it can be use for store, clean up, marinate. I have a few and will buy more. These tubs are really useful for a wide range of uses around the house or shop. I cut one side out of one and use it for a potting tray for my house plants. Works just as well as items that sell for five times the price. I plan to buy more to use as planters to grow small vegetables on my patio. Meanwhile I will use the ones that I have to organise my craft shop. The black color is a bit of a drag, but the low price more than makes up for it. These tubs sell for just under twenty bucks at my local supplier. I use these for putting meat into as i am prossing wild game just the right sie to lift when full, they kleen up easy and stack nice. Our teams love to consolidate everything, these buckets fit all of our cleaning solutions. It's very versitale and can be used for many different situations. Just your average cheap bus bin but it does its job wonderfully. The price on these is much lower than anywhere else i could find them. This is a great product for clearing off tables on family gatherings, also used to carry warm soapy water for cleaning the tables with.Can also be used to carry cleaning products in. This product is just what I needed, and at a much cheaper price than the local retailers even with shipping. I will be reordering more soon to use to hold our meat. Excellent product, espeically for how little money we purchased it for!! Holds lots of dishes and is high enough that you can't really tell what's in the bottom, which takes away from the eyesore. Handles on the side make it easy to grab, even when it's filled with dishes. They're the kind of item you always want to have plenty enough around. You'll be happy that you bought them! I needed bus tubs for curing ham and bacon before they are cold-smoked. I really didn't know what the quality of these would be since they are so reasonably priced, so I was very pleased when they arrived and turned out to be rugged and of good quality. If you need a bus tub that will hold up, these would be a good choice. Great product made of heavy duty plastic. I would say this product is a must for any restaurant that wants to put a lot of weight in their buspans. The price is also great.